1. You have a really hard time emotionally disconnecting from disturbing or heartbreaking news stories. You tend to carry around the images you saw, or the pain you heard, far past just watching the program. It can be hard to shake the feeling. 2. Emotional distress has manifested into physical symptoms. As in you’ve actually gotten sick from stress — headache, stomach ache, etc. 3. You’re easily influenced by the energy of others. You hurt when those you love hurt. And not just because you care about them; you just seriously hurt. 4. You almost always put others before yourself. 5. And it has, at times, caused you to ignore your own needs. 6. You’re incredibly perceptive to what people are interested in. Some have joked that you must be psychic (I mean maybe??? ), but in actuality you’re just very in tune with those around you. 7. You’ve dealt with chronic fatigue. Sometimes it feels like tiredness hits you with extra force than most. 8. You’re very comfortable being honest with how you’re feeling and/or sharing your current emotional state with others. 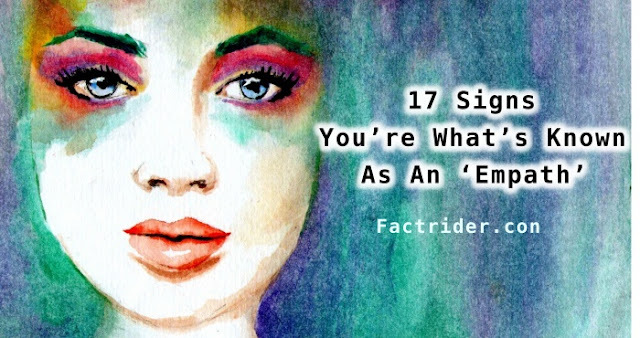 You don’t feel the need to sugarcoat or hide how you really feel. 9. You gravitate towards being the peacekeeper. When there is a problem in your friend group, you end up being the one trying to smooth everything out. 10. People come to you with their troubles/for advice. 11. You love to daydream when things get too mundane. You’ve been accused of living in your head. 12. You have very vivid and creative dreams. It’s not uncommon for you to have multiple and then remember them in the morning. 13. You’ve suffered from digestive problems. Like, I know. This isn’t something you want to openly shout to the world. But those with sensitive stomachs have a strong tendency to be empaths. 14. You crave alone time. As much as you love being with people, you need serious recharging sessions. People can drain your batteries, and it’s important you get that solo time to get back on track. 15. You consider yourself a free spirit. You don’t buy into materialism or abiding by the status-flow. 16. You are a stickler for the truth. Someone lying to you is not only hurtful, but something you do not take lightly. Honesty is very, very important to you. 17. Because you don’t lie, you’re not good at pretending to like something if you don’t. You find difficulty in going through with things you aren’t passionate about. You’d prefer to live a purely authentic life.